Despite widespread opposition from the Haitian people and many of their political representatives in parliament, the renewal for the mandate of the United Nations Stabilization Mission in Haiti (MINUSTAH) is set to occur on October 15. However, MINUSTAH's renewal should not be regarded as a step towards increased security and stability in Haiti, but rather an investment in the suppression of pro-democracy forces. Despite widespread opposition from the Haitian people and many of their political representatives in parliament, the renewal of the United Nations Stabilization Mission in Haiti (MINUSTAH)’s mandate is set to occur on October 15. 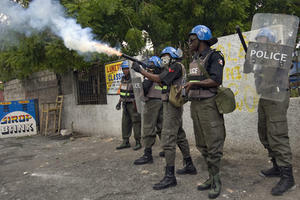 While strengthening the rule of law and establishing a civilian police force are certainly necessary steps for Haiti, MINUSTAH is supporting the establishment of a system in opposition to the popular demands of democracy and inclusion. On May 25, 2010, after MINUSTAH troops used tear gas and rubber bullets to break up anti-MINUSTAH protests by university students, they quickly entered the university to arrest student leader Frantz Mathieu Junior. The student hid in a washroom, but the soldiers chased him and kicked down the door. According to investigative journalist Ansel Herz, “Junior said he was forced to the ground and kicked repeatedly, then taken away. He says he was force-fed while in detention.” The rubber bullets and tear gas were also fired into camps of the internally displaced peoples, resulting in injuries of several women and children. On September 14, 2011, MINUSTAH tear gassed another student demonstration in Champs de Mars. The students were calling for an end to MINUSTAH’s occupation and also for an end to the mission’s impunity in regards to ongoing charges of sexual abuse and for introducing cholera to the country. Most recently, on June 15, 2012, MINUSTAH soldiers tried three times to enter the School of Humanities (FASCH) of Haiti’s State University, which left several people wounded by gunfire and many other students assaulted with teargas grenades. In addition to attacking and suppressing student protests, we are seeing President Michel Martelly follow a slippery slope towards dictatorship with MINUSTAH standing right beside him. In October 2011, Martelly ordered the illegal arrest and imprisonment of Deputy Arnel Bélizaire, an outspoken critic of the President, after he returned to the Toussaint L’Ouverture International Airport. At hand to help with the illegal arrest were members of the Haitian National Police (PNH) and MINUSTAH soldiers. MINUSTAH's strong support for Martelly goes back to the earliest moments of the presidency. While MINUSTAH’s mandate outlined in Resolution 1542 states that one of its primary goals is “to support the constitutional and political processes; to assist in organizing, monitoring, and carrying out free and fair municipal, parliamentary, and presidential elections,” it raised no objections to the well-documented electoral irregularities during Martelly's election in November 2010. Despite the UN’s wish for “transparent and credible elections,” MINUSTAH’s blind eye towards the exclusion of political parties, voter fraud, and counting irregularities provided political legitimacy in what amounted to the systematic exclusion of a majority of the electorate. On September 28, 2012, the Chief Prosecutor of Port-au-Prince, Jean Renel Sénatus, publicly discussed his dismissal by the Ministry of Justice because he refused to implement an order to arrest 36 political opponents, including the lawyers Mario Joseph, Newton St-Juste, and André Michel. Mario Joseph is one of Haiti’s most prominent human rights lawyers who is currently involved in a lawsuit against the UN for their alleged involvement in introducing the cholera epidemic to the country. He is also a leading prosecutor in the case against former dictator Jean Claude Duvalier. Newton St. Juste and Andre Michel have respectively brought up corruption complaints aimed at the President, his family, and members of his administration. When questioned about the threats and political intimidation aimed at Joseph, the United Nations remained silent on the issue, only stating that "we're certainly aware of the report... if I have anything further on that, I'll let you know." It is troubling that while MINUSTAH calls for the rule of law to be implemented in Haiti, they are silent when one of the legal system's strongest advocates—Mario Joseph—is threatened. Furthermore, instead of encouraging democratic expression by students—the future leaders of Haiti—they allow MINUSTAH to silence them with tear gas and bullets. The reality is that if Haiti did have a strong judicial and democratic system, MINUSTAH would not be able to get away with the routine human rights abuses they commit. MINUSTAH has had over 8 years to strengthen the judicial system in Haiti and reform the Haitian National Police, but instead it has spent the majority of its money on bullets, not books and education. While indispensable for the U.S. government and local business interests, it remains diametrically opposed to any effort on behalf of the popluar democratic movement. Thus the renewal of MINUSTAH's mandate on October 15 should not be regarded as a step towards increased security and stability in Haiti but rather an investment in the suppression of popular pro democracy forces.